The apostle Paul has been one of the most provocative, outspoken, enigmatic and influential men in history. In this stunning new novel, bestselling author, literary scholar and churchman Walter Wangerin recreates Paul the man. Here are rich insights into first century life: Paul was more travelled than any centurion or merchant; his heritage was both Roman and Jew. We catch glimpses of Roman lifestyles rich and poor, at home and abroad. We discover the pagan practices of Corinth; the rage of the disempowered Pharisees. Here is breathtaking drama: attacks, imprisonment and shipwreck. Here too are high emotions, played out in Paul's deep friendship with Timothy and fiery conflict with Peter. Yet we see how Paul's encounter with Christ shaped his life and his character enabling him to carry the torch of the gospel across the first century world. Wangerin has meticulously researched Paul's passionate and personal letters to the early church, and retraced Paul's Mediterranean journeys to inform this stunning portrait and powerful adventure story befitting the sequel to his outstanding The Book of God. 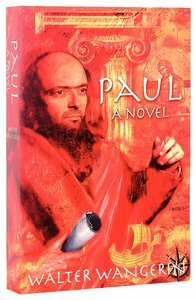 This volume is the epic story of St Paul, one of the the most provocative,utspoken, enigmatic and influential men in history.